Please join us for a special literary event with Alaska State Writer Laureates – Richard and Nora Marks Dauenhauer. Sunday, Oct. 20th at 7pm. Please see below for details. Nora Marks Dauenhauer was born (1927) in Juneau, Alaska, and was raised in Juneau and Hoonah, as well as on the family fishing boat and in seasonal hunting and fishing sites around Icy Straits, Glacier Bay, and Cape Spencer. Her first language is Tlingit; she began to learn English when entering school at the age of eight. She has a B.A. in Anthropology (Alaska Methodist University 1976) and is internationally recognized for her fieldwork, transcription, translation, and explication of Tlingit oral literature. Her creative writing has been widely published and anthologized. Her Raven plays have been performed in several venues internationally, including the Kennedy Center in Washington, D.C. In 1980 she was named Humanist of the Year by the Alaska Humanities Forum. In 1989 she received an Alaska Governor’s Award for the Arts, and in 1991 and 2008 she was a winner of the Before Columbus Foundation’s American Book Award. From 1983 to 1997 she was Principal Researcher in Language and Cultural Studies at Sealaska Heritage Foundation in Juneau. In May 2001 she received an Honorary Doctor of Humanities degree from the University of Alaska Southeast. In December 2004 she received the 2005 Community Spirit Award from First People’s Fund of Rapid City, SD. In 2007 the Central Council of Tlingit and Haida Indian Tribes of Alaska recognized her with a lifetime achievement award. In March 2010 she was inducted into the Alaska Women’s Hall of Fame. In November 2011 she was selected as an Indigenous Leadership Award Honoree by Ecotrust, Salmon Nation, Portland, Oregon. In October 2012, she was named Alaska State Writer Laureate 2012-14. Nora is also recognized as a clan leader. In 1986 she and two other prominent clan members were chosen by Austin Hammond to succeed him as leaders of the Lukaax.ádi (Sockeye Salmon) Clan and as trustees of the Raven House and other clan property. 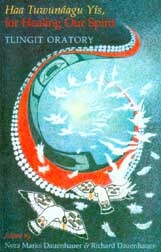 In November 2010 she was given the title Naa Tláa (Clan Mother) as the ceremonial leader of the clan. 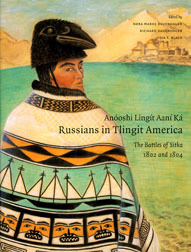 Her field recordings of over 40 years of Tlingit oral literature, now being migrated to CD format and archived, have already become an important source of primary data for a new generation of Tlingit scholars. Please see her full resume for her many additional honors and awards, and for a list of publications. 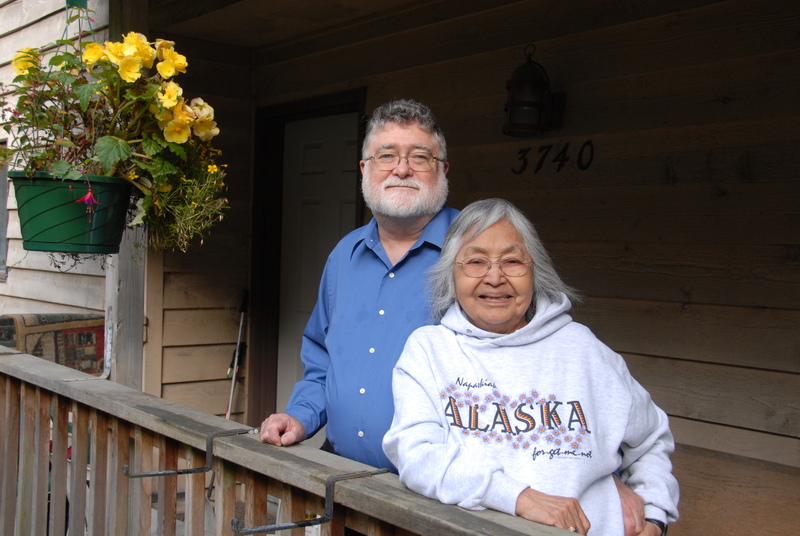 She is married to Richard Dauenhauer, writer and former poet laureate of Alaska, with whom she has co-authored and co-edited several editions of Tlingit language and folklore material. She has 4 children, 13 grandchildren, and 17 great grandchildren. She lives in Juneau, where she is semi-retired but still continues with research, writing, consulting, and volunteer work with schools and community. 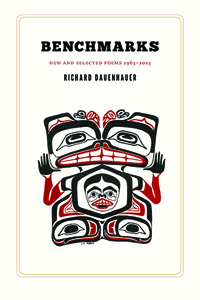 Richard Dauenhauer, born (1942) and raised in Syracuse, NY, has lived in Alaska since 1969. In 1980 he was named Humanist of the Year by the Alaska Humanities Forum. From 1981 to 1988 he served as the 6th Poet Laureate of Alaska, succeeding Sheila Nickerson and John Haines in that position. He is among the poets laureate featured in the April/May 1985 issue of Coda. In 1989 he received an Alaska State Governor’s Award for the Arts. In 1991 and 2008 he was a winner of an American Book Award from the Before Columbus Foundation. He is widely recognized as a translator, and several hundred of his translations of poetry from German, Russian, Classical Greek, Swedish, Finnish, and other languages have appeared in a range of journals and little magazines since 1963. He holds degrees in Slavic Languages, German, and Comparative Literature. Since coming to Alaska, much of his professional work has focused on applied folklore and linguistics in the study, materials development, and teacher training of and for Alaska Native languages and oral literature. He has taught at Alaska Methodist University and Alaska Pacific University in Anchorage, and part time at the University of Alaska Southeast in Juneau. From August 1983 to March 1997 he was Director of Language and Cultural Studies at Sealaska Heritage Foundation, in Juneau. In 2003 he rejoined Sealaska Heritage Institute as a linguist. In August 2005 he accepted the position as President’s Professor of Alaska Native Languages and Culture at the University of Alaska Southeast from which he retired in 2011. In 2013 he was awarded the Edith R. Bullock Prize for Excellence by the University of Alaska Foundation. He is married to Nora Marks Dauenhauer, widely published and anthologized Native American writer, transcriber and translator of Tlingit oral literature. He lives in Juneau and works as a free-lance writer and consultant in addition to his occasional teaching. Sunday, Oct. 20th at 7pm. Pioneer Park, 2300 Airport Way. For more information contact Jill Shipman at jill@fairbanksarts.org or 456-6485 ext. 222.